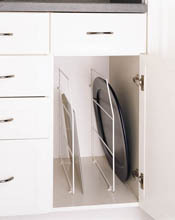 Cabinet tray dividers can make great use of narrow cabinets. Perfect for cookie sheets and baking trays. Wire frame snaps into four nylon fittings, included, which screw into bottom and back panel. See through wire design cuts down search time. Unit snaps out for easy cleaning. 12 1/4" high by 19 3/4" deep. Add 1/2" to height for fitting clearance. For installation, add 3/4" width for frameless cabinets. Includes tray, fittings and mounting screws. Heavy duty 1/4" wire frame with white epoxy coating. Sold per divider. Spice drawer insert. 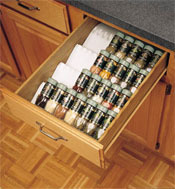 Insert is cut to fit inside your drawer to neatly arrange and organize your small to medium size spice bottles. Drawer must be a minimum of 4" tall. Available up to 50" wide for drawers up to 21" deep. Removable for easy cleaning. Sold per inch.